After finishing Book 6 in Jussi Adler-Olsen’s Department Q series I’ve been at a loss as to what to read next. The series has consumed me for the past couple of months. I need some short reads that leap off the page so I’ve decided to work my way through a pile of Japanese novels that have been sitting on my shelf for a while. I’m far from disappointed with this decision. I’m having an enjoyable time reading these stories as I love the unexpected and surprising things that Japanese authors throw at their (Western) readers. Much to my amusement I’ve been exclaiming out loud when reading. 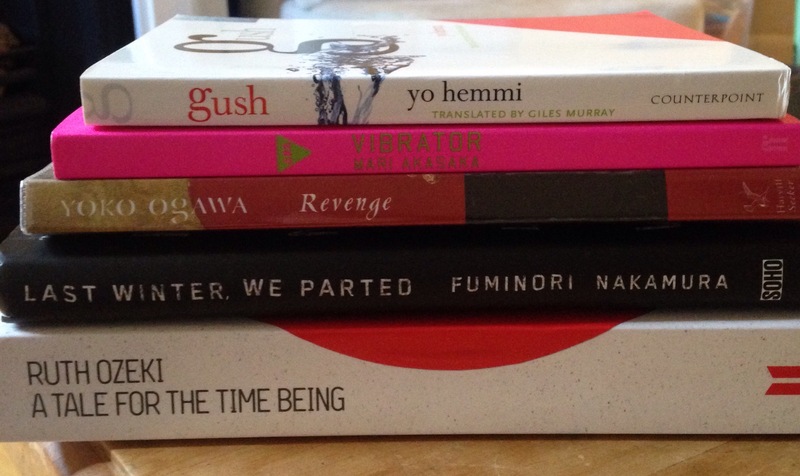 I anticipate a big contribution this month to my Japanese Literature Challenge! For different reasons I was just not enjoying these three novels. It will probably take a good convincing argument for me to retrieve them from the icloud. America stands at the brink of World War II. Last hopes for peace are shattered when Japanese squadrons bomb Pearl Harbor. Los Angeles has been a heaven for loyal Japanese-Americans – but now, war fever and race hate grip the city. The Japanese internment begins and a Japanese family have been brutally murdered. I love the setting and story of this novel. It is the first Ellroy I have read and I really wanted to enjoy it. However, I have become confused with the names of all the police characters. Who was that? Was he the one who…? Which one’s the boss? Who’s in charge? Where’d this guy come from? Maybe I hit a tough chapter while a bit sleepy but I haven’t felt compelled to try again since. Thank you to Random House (Cornerstone) for a copy of the title to review. I thought this short novel would be perfect for the Japanese Literature Challenge. I imagined it would be perfect to finish in one sitting on a relaxing afternoon: a novel of insightful observations with a deeper comment on the childless nature of so many Japanese families. While I knew it would be a novel of musings rather than plot driven, I just couldn’t get into it. Unfortunately it just didn’t pique my interest and I didn’t really care about the relationship the couple developed with the cat. I read a thoughtful review of The Guest Cat from Rare Bird who sums it up by saying it is most likely a flat translation. I agree. Thank you to Pan Macmillan for a copy of the title to review. Armed only with a counterfeit 100-Euro note, Ajatashatru the fakir, renowned conjurer and trickster, lands in Paris. His mission? To acquire a splendid new bed of nails. His destination? IKEA. And there he decides to stay, finding an obliging wardrobe in which to lay his head. I loved The Hundred Year Old Man by Jonas Jonasson and have seen a proliferation of similar quirky novels since its publication and success. I have avoided all of them but decided to give The Fakir a try. It is a light hearted comedy and I suspect I may have enjoyed it in a different context. The Fakir was a little bit too much of a caricature and for some reason AllTheRunOnWordsThatShowTheFakir’sCompetanceInEnglish annoyed me. Perhaps the book is just too lighthearted for my liking. Maybe I would have stuck with it if it was under 200 pages. The Hundred Year Old Man still remains my benchmark. Thank you to Random House (Vintage) for a copy of the title to review. After trying to help Benjamin Pearl, an undernourished, nearly feral eleven-year-old boy living in the Montana wilderness, social worker Pete Snow comes face-to-face with the boy’s profoundly disturbed father, Jeremiah, a paranoid survivalist itching for a final conflict that will signal the coming End Times. Jeremiah’s activities spark the full-blown interest of the FBI, putting Pete at the centre of a massive manhunt from which no one will emerge unscathed. This is actually a really well written novel and I feel guilty for not sticking with it and doing the author justice. It is a difficult story with a gritty and depressing setting yet I found it very readable. I always prefer to read something weighty but I after a while I found this novel just too upsetting. I think this is because since having my son I have become more sensitive to some stories about children. The plot itself is also rather plodding and atmospheric, beautifully written but sort of prolonging the misery. Rachel Teller and her husband David appear happy, prosperous and fulfilled. The big house, the successful business …They have everything. However, control, not love, fuels their relationship and David has no idea his wife indulges in drunken indiscretions. When Rachel kills a man in a hit and run, the meticulously maintained veneer over their life begins to crack. This should be a super quick and easy psychological thriller to read. I like the story and do want to find out what happens in the end but…something about the story keeps jarring and interrupting the flow which means there have been long reading breaks between chapters. Perhaps it is Rachel’s cool assessment of her loveless marriage that begins to bore me; she likes to describe their soulless of her home and explain her justifications for staying in the marriage. Or maybe I just find her annoyingly passive for an intelligent character. Thank you to Sam Eades at Pan Macmillan for a copy of the title to review. One snowy night in Toronto famous actor Arthur Leander dies on stage whilst performing the role of a lifetime. That same evening a deadly virus touches down in North America. The world will never be the same again. Twenty years later Kirsten, an actress in the Travelling Symphony, performs Shakespeare in the settlements that have grown up since the collapse. Thank you to Pan Macmillan (Picador) for a copy of the title to review. This is a long overdue review. Every reviewer who writes about Barracuda laments that there is no way they can do justice to the novel. This is so true and exactly why an almost blank draft has been sitting on my computer for quite some time. Danny Kelly has one wish: the escape his working class background. Talented at swimming, he wins a scholarship to an elite private boys’ school. Everything Danny does is concentrated on being the fastest and the best, sticking it to the rich privileged boys at his school. When Danny comes fifth at an international meet he he can’t cope with not being the best and begins to destroy everything around him. First Impressions: As expected, I liked Tsioklas’ writing style. I enjoyed Danny’s introduction to his scholarship school and could tell very early on that there would be so much more in this novel than there was in The Slap, and that was hardly light reading! Highlights: Class is the main issue in this novel with everyone’s hang ups hinging on their social standing. I heard Tsiolkas in Conversation with Richard Fidler and he makes the strong point that for a country that prides itself on being a classless society, the reality is that everyone is obsessed with class. I found this element of the novel interesting as it is almost a taboo to write so openly about it. Tsioklas writes a lot about the pretentiousness of the upper class and their need to keep their distance from the lower classes. There are so many vignettes about the wealthy that sound both ridiculous but completely believable at the same time – surely the author has heard these stories first or second hand? The remodelled house so that the family can change the street address? The father who personally upgrades his son to first class on a domestic flight to a swim meet? I also enjoyed the now famous rant in the book about how Australians claim to be anti-authority and hate following rules but in reality they are all incredibly law abiding- I can relate as I remember arriving in London and being amazed that people could take their dog on public transport and then sit down and eat a burger and chips! As someone who spends half his year in Australia and the other half in Greece, Tsiolkas has a keen eye for these ironies. Finally, I can feel Danny’s awkwardness when he constantly explains how the rich kids at his school are always at ease as they feel they have the right to belong whereas he always needs to justify his presence. So touching. If I was an editor: This novel isn’t shy at commenting on contemporary Australia. It’s boldness is admirable. I preferred the flashbacks to Danny’s earlier life and wasn’t as interested in exploring his current situation. Although wonderfully written, I found all of the sections of Danny’s feelings almost too much to keep reading through. I had to stop and start a lot when reading this novel as it is just so dense. I don’t know if the final revelation about what happened to Danny justifies wading through everything before. Overall: Worth reading but overwhelming at times. I changed the star rating many times throughout. 1717: A Finnish family move to the isolated Blackasen Mountain in Swedish Lapland. Winter sets in and the Lapps call it a Wolf Winter: the kind of winter that will remind people they are mortal and alone. A body is found on the mountain and only the newcomers are interested in knowing who committed this murder. What secrets does the mountain community hold? First Impressions: I was instantly transported to 1717 Lapland. I felt the isolation and, as the story progressed, the oppressiveness of the snow. Highlights: I loved the historical context of this novel. I can’t believe I am about to say this but I wanted more information about the wars Sweden was involved in as the trickle down effect they had on the settlement was just not enough! The priest was my favourite character and I wanted to know more about him. I thought he was the best written character which is interesting as the author is female and the other two main characters are also female. There is so much in this novel and the author has struck the right balance between the mysterious and reality. It’s a fascinating community she has created, a snapshot of another era. The role of women was definitely complex. Based on other reviews I was worried that Maija may be a snowbound Miss Marple trying to solve the crime but no, she was merely curious and her involvement in trying to solve the case was believable. On a different note, I really enjoyed reading the extras at the end of this novel. These sorts of author interviews are usually superficial but Ekback was answering some really probing questions! If I was an editor: The novel is primarily about relationships with murders and disappearances muted in the background and adding to the atmosphere. It was therefore a little surprising at the end to see such a focus on how much the disappearances were disturbing the community. The answer to the crimes and disappearances also felt too modern. Overall: A perfect remedy for those still suffering from Burial Rights withdrawal. Thank you to BookBridgr for a copy of the novel to review.